A German and an Italian go on a Polish online shop… Sounds like a start of a bar joke? The situation indeed seems bizarre in spite of all the EU propaganda about the Digital Single Market. The German and the Italian simply won’t understand a single word. They cannot find any products in this Polish shop. 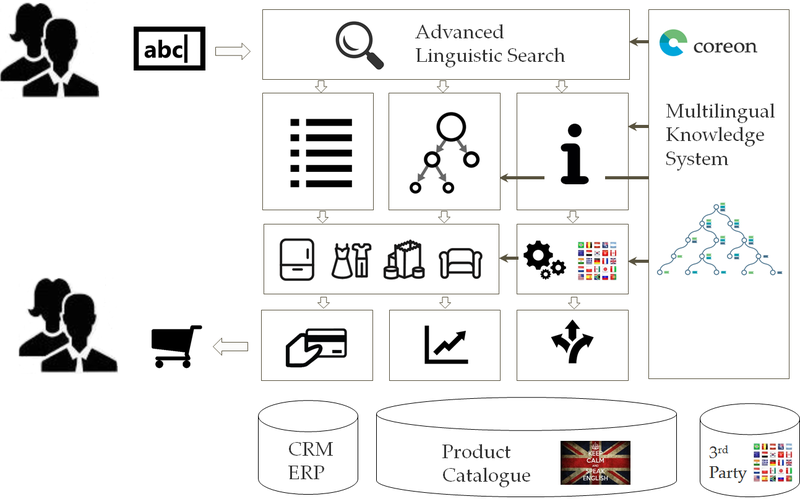 Translating static content and product catalogues into English will surely help. In some EU countries half of the population has a satisfying passive command of English. However, that percentage becomes quickly minuscule when consumers have to enter the right English search term for a specific domain. Translation into all or even only into mayor languages is in almost all cases cost prohibitive. Domestic Customers have a Hard Time, too! For domestic customers it’s not easy to find products either. Today’s string based search often returns no matches. Or it finds too many, displayed in unintuitively sorted lists, which has the same effect. Instead of searching semantically for what the customers wants, online shops expect their customers to enter the very same strings they have used in their catalogues. Scroll Hit Lists or Explore Product Offering? Search results are displayed in list of matches, a column of product names or tiles of product images. But what if there are plenty of matches in multiple categories? An alternative, more natural way would be to display the search result graphically in a product tree with related products closely organized. This way the shopper can quickly find the product she was actually looking for and is motivated to buy more. E-commerce has increased the buying options to a degree, which leaves many consumers completely lost. Therefore online shoppers often rely on third party information such as tests, feedbacks, blogs, etc. to make a buying decision. Shops want to give their customers the comforting feeling of having made an informed and good decision, without having to leave the shop. The ALS deals with language specifics such as morphology, spelling variations, etc. 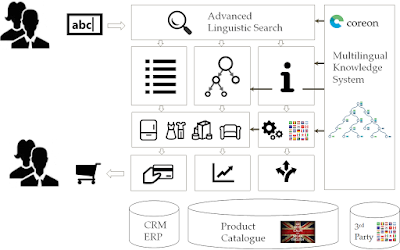 Deployed with the MKS it can expand searches semantically and across-languages. The MKS stores the product knowledge in different languages. Its knowledge graph is used for product exploration. Relevant products are listed by semantical proximity, not string match scores. Alternately the shopper can explore the offering in a product graph. Supporting third party information is provided, machine translated if originally in a different language, to help the consumer to make buying decisions without leaving the shop. The above solution, based on a Multilingual Knowledge System such as Coreon, enables online shops to sell much more. Without ongoing translation efforts, shops can drastically extend their customer base in the Digital Single Market. For shops in almost half of the EU countries that increase would be hundredfold! I really interesting topic you posted and unique content. Java Training Institute in Chennai | Java Training Institute in Velachery. Thanks for posting this useful article with impressive content.. keep sharing.. Excellent blog, The strategy you have posted on this technology helped me to get into the next level and had lot of information in it. Nice blog..You have clearly explained about new domain and develop..Its more useful and informative.. Wonderful Blog with informative content. It was very easy to understand. Thanks for sharing such a nice information.. Wonderful Blog...Thanks for posting this interesting post with us.